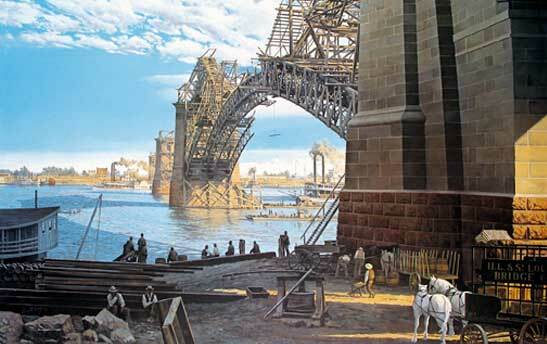 THE EADS BRIDGE "The Eads Bridge Under Construction, 1873" depicts the bridge prior to its completion in 1874. In the late 1860's St. Louis was the hub of steamboat traffic. Chicago was gaining in importance as a trade center due to the railroads. A group of St. Louisans, realizing the importance of rail traffic to the area, formed the Illinois and St. Louis Bridge Company. They knew their future depended on bridging the Mississippi and Captain James Buchanan Eads was given the project. Captain Eads accumulated a vast knowledge about the Mississippi River. He started out as a steamboat purser and later operated a profitable river salvaging business. He was also responsible for building a fleet of armor- plated steamboats used to defend the waterways for the Union cause during the Civil War. Although he had little formal education, Captain Eads was an outstanding natural genius who accomplished many firsts with the completion of the bridge. At the time, the Eads Bridge was the largest bridge ever constructed. It was the first bridge in the world to use alloy steel, marking the end of the iron age. Its cantilever method of construction was the first of a bridge that size. Upon completion of the bridge, several methods of testing were used to assure the public it was safe. The non-scientific method consisted of walking an elephant across the bridge. Everyone knew that elephants had an uncanny instinct and would not set foot on an unsound bridge. The crowd cheered as the great beast from the local menagerie mounted the approach without hesitation and lumbered across to the Illinois side. The scientific approach consisted of having fourteen locomotives, weighing more than 550 tons, drive back and forth across the bridge while a team of inspectors measured the bending of the arches under the load. 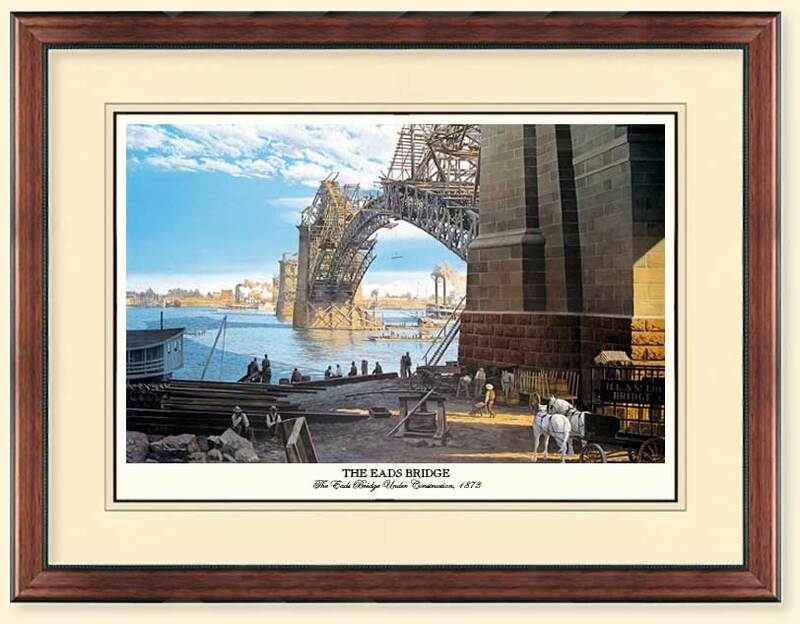 The Eads Bridge opened July 4, 1874 and remains in use today.